Keep the carpet sample until the carpet has arrived and is ready to be installed. Before you invite a carpet company to send out their salesman to measure and give you a quote. 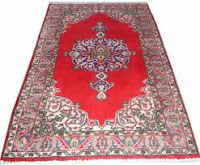 Make sure that the manufacturer's name, style, color, yardage, density, yarn, price per yard, unit price, total price, padding specifications and price, sales tax, installation charges are all noted on the paperwork. Request an installation bond to ensure that they bring the right carpeting the first time.